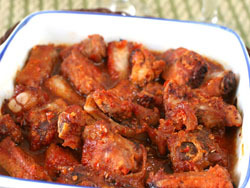 Make barbeque ribs that will melt in your mouth. Spareribs are pretty fatty, so you have to brown the meat under the broiler for 30 minutes to remove the excess fat. If you are looking to save time not money, use the more expensive baby back ribs, there is no need to broil these. But still wipe off with paper towel to get any excess moisture. Mix the sauce ingredients in a separate bowl. Brown the meat if needed under the broiler. Place onions in crock pot. Cut the ribs into serving pieces. If using back ribs, make each piece 2 bones. Put in crock pot and pour barbecue sauce over ribs. Cook on Low setting 8 - 10 hours or High setting 4 - 5 hour. Time saver! Use your favorite bottled barbecue sauce rather than making your own. You'll need about 3 cups of sauce.